I am a supporter of independent businesses and would source locally and independently as much as I can because I am also an independent business woman myself. Thanks to TomEatsJenCooks, I came across Gideon's Terrines. Gideon used to live with both and I had heard many stories of homemade terrines and the gunk of blood and offal hanging around in Jen's kitchen as Gideon is boiling liver and baking hock. I always imagined some sort of crazy scientist boy sweating away in terrine passion, in his white apron covered in gore, his wellies up to this knees, holding a butcher knife in his black gloves. But Gideon's pursuit came about when him and his friends used to do cook offs, and every week, they would of course have to out do the other one. Gideon found his calling when he started to make terrines. To better this competition, he decided to make really intricate terrines and had such fun deciding what to put in them and how to layer them that he became obsessed with them ever since. Gideon is an architect by day and a terrine maker by night and weekends, "I love the versatility of a terrine," he says with a smile that runs from ear to ear, "and I love the way that, when you slice through, the interior can look completely different from the exterior or even reveal hidden layers of ingredients and flavours that can be very unexpected. That was part of the thought process behind the Ham Hock terrine. I loved the contrast of the bright green leaves and the pink flesh of the ham with veins of green parsley jelly running throughout. You can create some really beautiful compositions." I love that someone gets so passionate about something specific. Its like the Tracklements guy, who couldn't buy the mustard he really wanted to eat, so he made his own, jarred it, sold it and now has over 50 pickles and condiments. I hope this for Gideon - its wonderful to see something budding. "I also revel in the fact that anything can go into a terrine - fish, meat, veg and the pieces of ingredient can either be large chunks, minced, battoned, whatever shape you need to create the desired cross section. I'm currently designing some vegetarian terrines which I'm hoping to take to the market this weekend. I think beetroot would be a great ingredient to use for its colour. I could imagine staining Vietnamese rice paper a dark dark crimson with beetroot juice, lining a terrine with the paper and filling the inside with layers of spiced colourful veg. Would look amazing when you cut it open". I bought the rustic, duck and peppercorn and ham hock terrines for my Sunday morning breakfast and I absolutely love the intricate flavours of the high quality cuts of pork. I love the way, you can see the different ingredients and how pretty appetising it looks on my bread and how it all collates to how much love Gideon has put into his amazing project. He also does preserves in beautiful jars of Pork & Cider, Venison & Armagnac, Duck & Juniper. 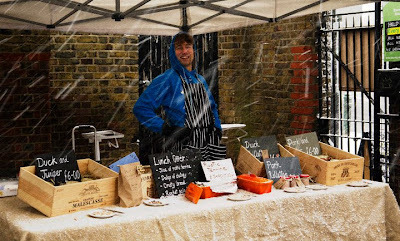 Gideon's Market stall is in the School Yard bit at Broadway Market, London Fields in Hackney on Saturdays. Look, he is even there when it snows - that is dedication for you. Bring him a cup of tea, see the smiles for yourself and buy Gideon's delicious, succulent, finger licking terrines.